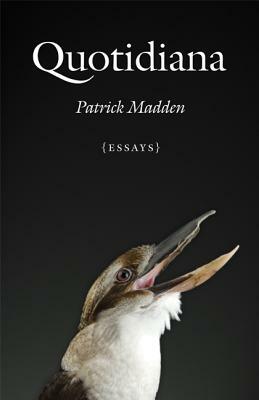 In Quotidiana Patrick Madden illuminates common actions and seemingly commonplace moments, making connections that revise and reconfigure the overlooked and underappreciated. Madden muses on the origins of human language, the curative properties of laughter, and the joys and woes of fatherhood. Sparked by considerations of selling garlic, washing grapes, changing a diaper, or chipping a tooth, his essays are an antidote to the harried hullabaloo of talk-show and tabloid culture—and a reminder that we are surrounded by wonders that whisper to the curious and attentive. Ingenuous and erudite, and with a beguiling wit, Madden examines the intricate tapestry of ordinary life in its extraordinary patterns. His book is a poetic and engaging exploration of the unexpectedly wide scope of our everyday existence. Patrick Madden is an assistant professor of English at Brigham Young University. His essays have appeared in the Iowa Review, Portland Magazine, Fourth Genre, Hotel Amerika, and other journals, as well as in the The Best Creative Nonfiction and The Best American Spiritual Writing anthologies. Visit his Web site www.quotidiana.org.